Welcome to your handy masterlist, which will be updated throughout with new fills so you'll be able to keep track of everything without trawling through the whole promptathon post (although that's fun and I highly recommend it *grins*) and then hopefully you won't miss anything! We have the full promptathon post here where you post your fills, an epic spreadsheet here to help with keeping track, and please read the rules for posting fills HERE. THEN COMMENT TO THIS POST WITH A LINK TO WHERE YOUR FILL COMMENT IS ON THE PROMPTATHON THREAD. I would not ask you were you came from, I would not ask and neither would you. Honey just put your sweet lips on my lips, we should just kiss like real people do. Natasha is trying to find jeans that fit. Clint is her shopping companion. Clint actually doesn't get hurt on missions all that often, too much situational awareness. But everyone remembers the time he sprained his neck getting the Nutella down from the top shelf. Or the time he broke his toe when he walked into the couch table. Nat doesn't know if she wants to pity him or headslap him. 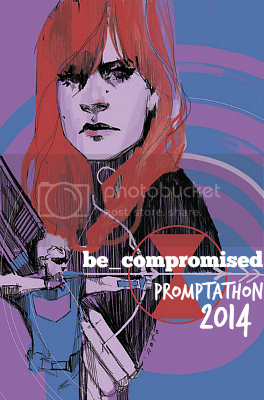 "You don't have my permission to die"
Clint and Natasha find Real Person Fic of themselves. Natasha's a war bride, and Clint's a soldier. card. Which is how she and Clint found themselves at the town hall, filling out a marriage license. Every morning, she makes the decision not to kill him for one more day. Clint and Natasha go to Ikea. Clint and Natasha assemble Ikea furniture / Clint’s not sure how it happened, but one day he wakes up and they’re living together. Clint is a professional matchmaker and Natasha is a professional matchbreaker (for when things don't go so right, but she'll look the other way too if it's just a meddling parent). They get hired for the same couple. Stranded in the middle of nowhere in Australia, Clint and Nat face terrifying things like emus. (Aka, I didn't sign up for this). Especially if it's an early partnership fic. Clint is a hapless grunt worker that stumbles onto some big mafia shenanigans. Natasha is the CIA agent tasked with keeping him safe as a result. Early partnership-Clint plays matchmaker trying to set up Natasha with young recruits. AU where Clint and Kate work at a pet store. Natasha starts coming in with questions about this cat she is not acquiring that she is not purchasing things for. Kate is amazing at wide-eyed confirmation of denial. Bonus points if she thinks Natasha simply made the cat up since she seems way more interested in oblivious Clint is oblivious and always seems to leave irritated that he learns more about the cat than Natasha. Natasha thinks she's a better person around Clint. Clint thinks she's been that person all along. They're both wrong. Clint and Natasha have to go undercover at a theme park as costumed characters – heroes Hawkeye and Black Widow from The Avengers. People tell Clint he makes a pretty good Hawkeye, but Natasha keeps getting told she really looks nothing like Black Widow. If you have to look along the shaft of an arrow from the wrong end, if a man has you at his mercy, then hope like hell that man is an evil man. Because the evil like power, power over people, and they want to see you in fear. They want you to know you are going to die. So they'll talk. They'll gloat. They'll watch you squirm. They'll put off the murder like another man will put off a good cigar. Learning to share a bed. It's the journey, not the destination. Dystopian road/journey fic, AU or not. Clint's not quite sure how it happened, but one day he wakes up and they're living together. Sometimes Natasha thinks Clint Barton is the very antithesis of the Red Room. Hawkeye meets Spider Man on a roof. As you do. Natasha wants to know what is it with Clint and these young wannabe superhero idiots. Avengers/Amazing Spider Man, also featuring Kate from Hawkeye comics and possibly other youngsters? Clint is asexual but not aromantic. Natasha starts hanging out with him for the break from sexual attention and ends up falling in love with him. Clint and Natasha being domestic together. Natasha and/ or Clint get sent back into time to Natasha's early childhood. They have to choose between maintaining the timeline and saving bby!Natasha from her fate. Coffee shop NOT AU. Post Avengers, pre Winter Soldier, The Avengers have moved into Stark Tower and everyone is busy with their own lives. Clint, meanwhile has been suspended and feels useless. There's a coffee shop on a lower floor in the tower that he notices being understaffed or having someone quit when he's exploring and this, Clint feels, he can be qualified for. Natasha was being sold by the KGB and was going to end up dead when Clint bought her to save her and bring her to SHIELD. It takes him a while to convince her not to treat him like her new master/handler. "Natasha has been wondering about this for a long time now. Finally, she can't stand it anymore. "Maria,"" she asks over a cappuccino. ""Do you have any idea why so many people seem to be convinced that Barton and Coulson are a Thing?" Also Natasha falls in love with Clint first, if you squint. Notting Hill AU. But seriously, can't you just see bookstore owner Clint fall for movie star Nat? And all his friends that he calls The Avengers rooting for them? Early SHIELD days or at least pre-Avengers days, when both Natasha and Clint are living on base or at a SHIELD facility, they have insomnia. Cue late night wanderings, food, tv shows, talking, companiable silence... Sometimes other people who're awake as well maybe. Clint shows up 15 minutes late with Starbucks. One of the two just can't handle spicy food, to the endless amusement of the other. Clint really thought he could handle everything life could throw at him. Then he saw Natasha, baking cookies. Clint has seen many scary things, but none so terrifying as Natasha before her morning cup of tea. Natasha is absolutely horrified to find she enjoys cuddling with Clint. Death fic. Natasha reads Clint’s will or vice versa. Put Clint and Natasha in your place of work. Natasha owes Clint a debt. After all these years , she is shocked when he calls it in. The Black Widow likes to play with her food. Hawkeye watches. And because I always love seeing what people come up with for this: AU put Clint and Natasha in your place of work. I know you'd die for me, but would you live for me too? Natasha has spent five years trying every trick in the book except telling Clint point blank that she loves him, but when he tells someone she's like his sister, that's the last straw. SHIELD was formed to protect against the supernatural. The Great Strangeness began in the wild places and is slowly spreading across the globe, leaving people changed in its wake, or at least those who survive as villages become forests and creatures destroy lives. Humans flock to the cities, populations becoming concentrated, like gathering around campfires in the dark. Clint has arrows dipped in holy water. Natasha has silver bullets. And one of them has a secret. Pacific Rim AU / Pacific Rim AU. Because there are never enough Pacific Rim AUs. Trusting Clint was easy. Trusting herself around him? Not so much. That time Clint tried Nat's signature thigh chokehold in a desperate attempt against a goon. Fake!engagement. Natasha and Clint go undercover as a soon to be married couple to catch a criminal using a wedding planning business as a front. We're talking cake testing, dress fittings, wedding song choices, the works. Natalia Alianovna is the world-famous Russian ballerina, even if no one knows the brutal training that got her there. Natasha Romanoff is the exchange student next door that Clint falls for, never realizing she's the poster he has hanging on his wall. You know how people have pinboard or sticker maps with all the places they've been marked with coloured pins? And maybe places they want to go? Clint and Natasha have a map, which started out as a joke and was on the wall of Coulson's office or a SHIELD breakroom, but has migrated to the Avenger's Tower or elsewhere... Anyway, they have this map. With all the places they've been shot, stabbed, fallen from high places, fake married someone, fake married each other, been arrested, broken out of jail, been banned by that country's government, been banned from going to again by Fury... Insert amusing conversations and/or incidents. (Post Winter Soldier) A battered and bruised Natasha walks into her apartment, the one in New York that they share. She grabs a throw pillow off the end of the couch and startles a napping Clint awake when she starts beating him about the head and shoulders with it. "Come with me, you said! Work for the good guys, you said! Clear some red from your ledger, you said!" Meanwhile, Clint is all like "Hunh? Wha-? What happened?" By the time Clint arrived outside Stark's lab, there was smoke seeping out from underneath the door. The hand-drawn sign stuck to the door said 'There Be Dragons.' He turned to Tony, who was wheezing and covered in soot. "Please tell me that's a joke." Stark just looked at him, and something in his eyes hit Clint like a punch in the gut. "Tony?" he said carefully. "Where's Natasha?" JARVIS is a total shipper and tries to get Clint and Natasha together. Soulmarks AU where Clint has an hourglass on his back over his heart and Natasha has an arrowhead on her front over her heart. They come from different cultures though that interpret these marks differently. Soulmarks is just one theory on what they mean. Natasha recognizes Clint when he has an arrow pointed right at the arrowhead mark. The Black Widow likes to play with her food; Hawkeye watches. And that's a wrap, folks! You can still fill prompts, just add your creations to the comm as normal - they won't be added to this masterlist or classed as promptathon fics. Huge amounts of thanks to everyone who prompted, filled, reviewed, commented, beta read, did cheerleading, and generally took part, you bar made of wonderful!